Dating Pro Configurator is a place where people can build their own customised product by adding extra features to the basic dating site set. 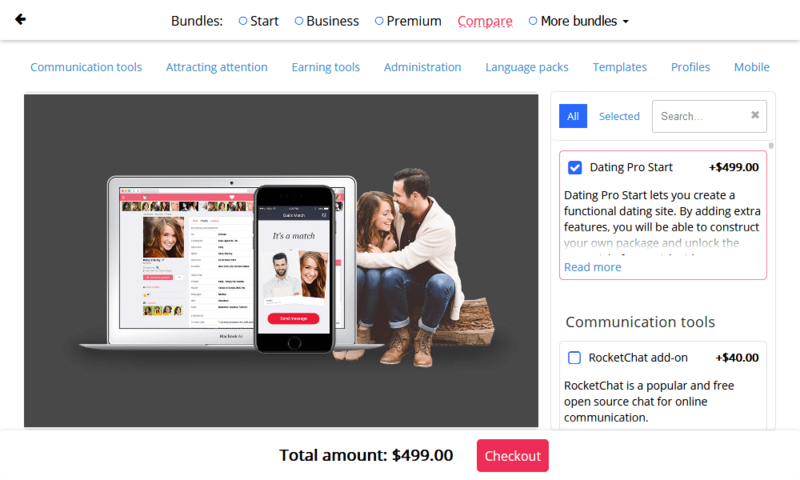 -give the customers the opportunity to build a package of their own instead of imposing our own views of which features are necessary for a dating site. This was not our first attempt at creating a dating site constructor. The previous attempt included a step-by-step system that was not much of a success because the choice was quite limited and it was difficult to visualise the options. This time, we got our inspiration from car configurators. Now the choice is much greater, also more visual, and we keep adding new features to the constructor. Navigation is the cornerstone that we are continuously improving. Initially, the main navigation hinted at the difference between ready packages that we call licenses, and the actual builder ('build your license'). Then we thought that it would only confuse people and went for a simpler solution where all packages, both custom and ready-made, are displayed in one place. At the very top, we are showcasing ready packages. The most popular packages are visible immediately, and some extra, niche options appear when one opens the drop-down menu. 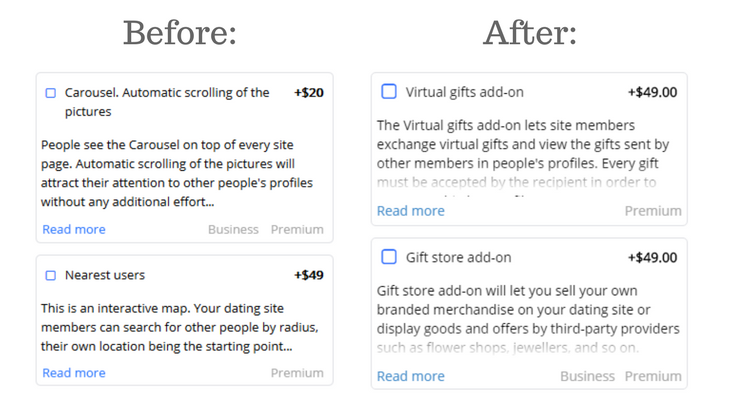 We've also added the categories of add-ons and services to help people find their way around. The names of the categories introduce the features on the right. If you click on a category name, auto-scrolling will take you to the add-ons from this category. On the left, there is a screen that shows feature previews. It can be still images, animated GIFs and videos. To the right is where the most work happens. You scroll through the list of features, click on a feature to view it in the preview screen on the left, click 'read more' to find out the details, select the checkbox to add it to your package or deselect to remove it from the package. You see the package that is currently active at the top right. Once you remove a module or start adding new modules to a ready package, you are in the custom package mode called 'My bundle'. One only gets to receive a discount on the ready bundles. Instead, a custom bundle gives people the opportunity to only select the features that they really need. 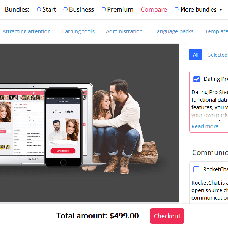 The Start package is the basic bundle with the essential features that you can expand by adding more features from the list. If you don't need any packages and are only interested in one or two add-ons, there are two ways you can proceed. First, continue to checkout and remove the items you do not need from the shopping cart, or come directly to the Marketplace and buy the modules that you want there. Initially, we wanted to display the module illustrations on the left along with the scroll. As you scrolled up or down, whichever module came into focus approximately in the middle of the page, would be shown on the left automatically. After a series of tests, we changed that. Now a visitor needs to deliberately select a module to see it on the left. It gives them more control and reduces confusion. We added the 'All' and 'Selected' tabs. The 'Selected' tab shows the add-ons that are currently in the person's shopping cart, and one can add more features or remove the ones s/he does not need. We also added the 'View and add more features' button to make it clearer that one can add more features to the selected bundle. Our other steps post-launch, based on the usability tests, were to add the search form to find add-ons by keywords, increase font size and the size of checkboxes, and to make it clearer which of the modules on the right is displayed on the left. -the 'Deselect all' option for easier browsing and experimenting with prices. 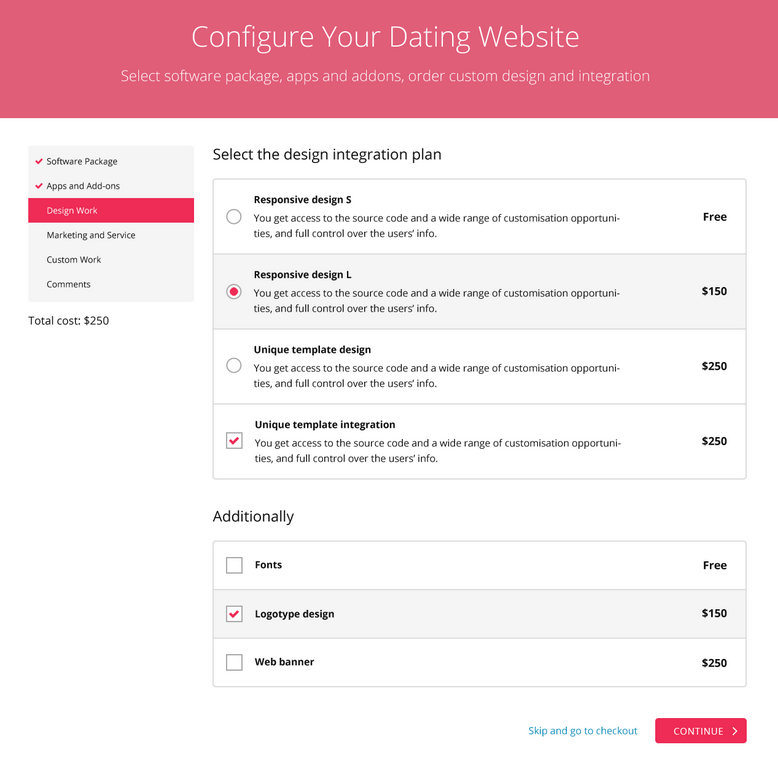 We hope that with the help of the Dating Pro Configurator, people will be able to receive a fully customised dating site, fine-tuned to reflect their niche ideas.